In the coming months, all segments of the White Pine Trail will be completed and connected. What impact does the beloved trail have on the economic development and health of West Michigan? Lauren F. Carlson explores the history and the future of this beloved trail in Rapid Growth's Moments on the Trails series. The Fred Meijer White Pine Trail State Park is a recreational staple for West Michigan. With its 92 miles utilized by bikers, hikers and nature enthusiasts, this particular Michigan trail is one of the longest in the state. 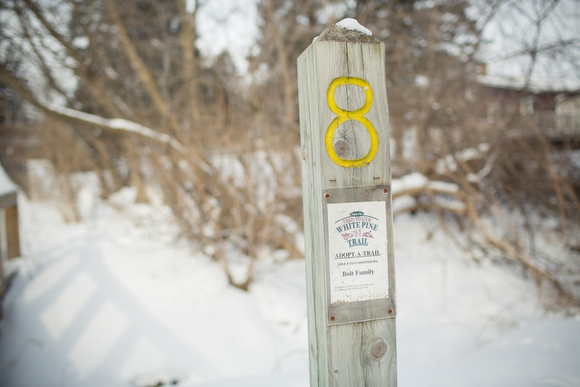 Connecting Grand Rapids to Cadillac with access points all along the way, the White Pine Trail has provided a wealth of exercise and entertainment for Michiganders for almost two decades. Now, as it nears completion in 2015, those instrumental in its development look back at the White Pine Trail's construction, and look forward to the benefits it brings each community it touches. "It's a great western link from Grand Rapids to Cadillac," says acting State Trail Coordinator and former Land Program Manager for Michigan Parks and Recreation Paul Yauk. Yauk, who has been working on the White Pine Trail since its beginning in the late 1990s, managed the plans for the project and worked closely with the five distinct counties through which the trail traverses. This initial development included construction and repair of the 16 existing bridges on the former rail corridor. "You've got 92 miles of trail and you just can't get over the bridges," he says. Other obstacles included overgrowth, various trespasses and lack of community support. "Back in the old days, there was not as much support as there is now," says Yauk. In the almost twenty years since the project's inception, communities began to rally around the trail's benefit to its individuals and its economies. "Things have changed because a lot more people are using it," he says. As support grew, so did funding. As the Michigan Department of Natural Resources (MDNR) and the Michigan Department of Transportation (MDOT) paired grant money with local funding, a majority of the trail was paved in asphalt, allowing for a smooth ride through the majority of the urban areas of the trail. However, "it was never intended to be fully asphalt," says Yauk. Today, as the MDNR looks forward to finishing the remaining 40 miles of the trail, they intend to do so in another cheaper, though equally useful, medium. "It's a pretty durable, hard-packed surface," says Annamarie Bauer, northwest regional planner for the MDNR, of the crushed limestone that will complete the sections of trail from Sand Lake to Big Rapids and from Reed City to LeRoy. Encouraged by MDOT to utilize this less expensive option, the MDNR will complete the White Pine Trail in this material that can be easily traversed by foot, road bike or wheelchair. Saving the state and local communities over $100,000 per mile, the crushed limestone is an option long explored for this particular trail and others throughout the state. Staying within budget is particularly vital for Bauer who, in her role working with MDOT and local communities, oversaw much of the fundraising for these last legs of the trail. "There is no fund for trail development," says Bauer. "It's all constructed with grant funding." Without allocated funds to complete trails in Michigan, MDNR staff work to obtain 75 percent of their money from grants, and 25 percent from private and local donations. Often, communities of all shapes and sizes who see the benefit of the trail work to raise the money themselves. "We like communities investing in projects within their communities," says Bauer, thankful for the hardworking individuals who get the word out and who are even willing to hold small fundraisers and even bake sales to make up the difference. One organization in particular that has worked tirelessly on the funding and maintenance of the White Pine is the Friends of the White Pine Trail. "The Friends of White Pine Trail is a hardworking and dedicated group of volunteers who take great pride in this trail. 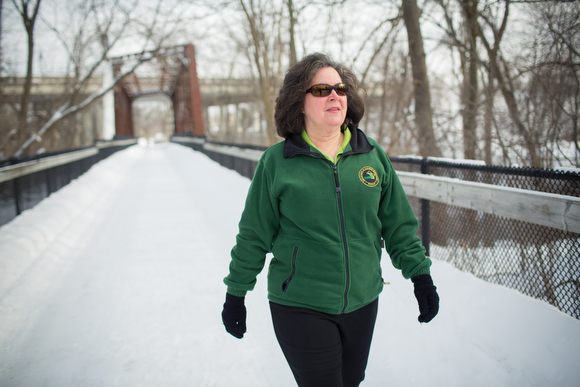 They are always looking for new members to grow their organization and support their local efforts," says Kati Santee, Executive Director of the West Michigan Trails & Greenways Coalition (WMTGC). With support such as this, the MDNR worked on the slow but sure development of the White Pine Trail. "[We] developed the trail in segments as funding was available," says Bauer. Pairing passion with planning, funding and great timing, the MDNR can finally look forward to the completion of a rail trail whose rail corridor was acquired in 1993-1994. Though rolling bridge construction at Tamarack Creek and Rice Creek in Montcalm County will continue into 2016, trail users will have full use of the White Pine's 92 miles at the end of the 2015 construction season. Despite the many obstacles and time required to complete each section, Yauk, Bauer and the communities touched by the White Pine Trail can easily see its many benefits. In addition to the many healthy activities of walking, running, biking or even rollerblading the White Pine, the trail also brings families together to enjoy the great outdoors. "Trails are used by people of all ages and of all abilities," says Bauer, who frequently guides her mother in her wheelchair through the many sites along the trail. In addition, "trails have become a new economic engine," says Bauer. The White Pine Trail in particular has benefited cities such as Rockford, bringing people and money to local businesses, and encouraging them to stay with mid-trail refreshments, scenic stops such as the Rogue River dam and summer events such as the annual Start of Summer Celebration. 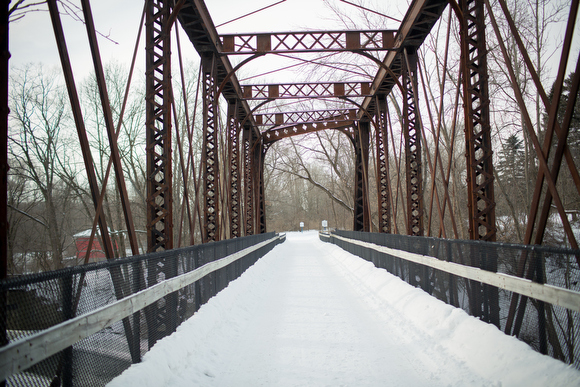 "Rockford is the city I use as a perfect trail town," says Yauk, referencing the many improvements the city has made in light of the heavy trail traffic. "Rockford has done a great job," he adds. As excited Michiganders look forward to the 92 miles of the White Pine Trail finally being connected this year, so too are the individuals who have labored with love on this long and worthwhile project. Combining asphalt with crushed limestone and grant funding with community support, the White Pine Trail continues to offer a path to recreation and exploration from north to south on the west side of Michigan. This article was made possible by the West Michigan Trails & Greenways Coalition. For more information about the WMTGC, visit wmtrails.org.